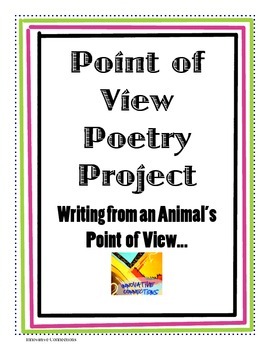 This is a FUN Activity for teaching first person point of view and inspiring creative writing! 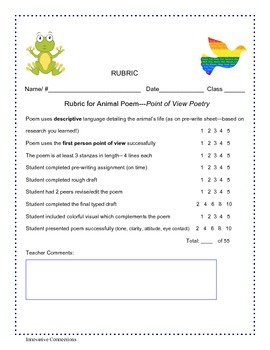 Document consists of guidelines for writing and project (with due date with peer editing/revising signature blanks), poetry pre-write organizer, & a grading rubric for teachers. 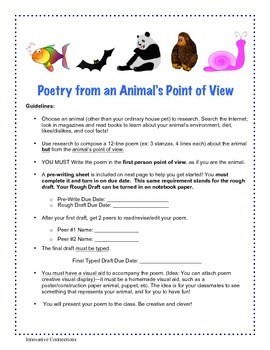 Students write from the point of view of an animal they choose. I encourage them to all choose animals other than common domestic animals and we list them on board so that no 2 students write about the same animal. Requirements include a creative visual display, which supplements the poem for oral presentation and student work displays. 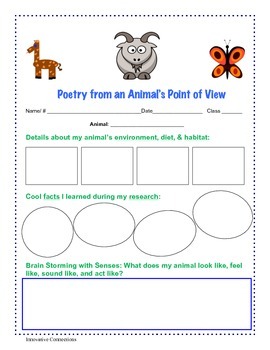 Focus is 1st person point of view which is an easy literature element for them to remember through this activity; the guidelines instruct students to include various aspects about the animals--which gets them to go look for the information in books, magazines, and computers and not just write what they think an animal does, eats, likes, etc. I use this project during our Discovery Unit, and they really have fun presenting them, as well as hearing about all the different animals! A fun presentation is easier for students to do in front of their classmates too! It's a great cross-curricular activity for Science too!